Get ready for an early Holiday blowout this November as Eastwood City and Astroplus bring this year’s biggest music, video and gadget super sale! 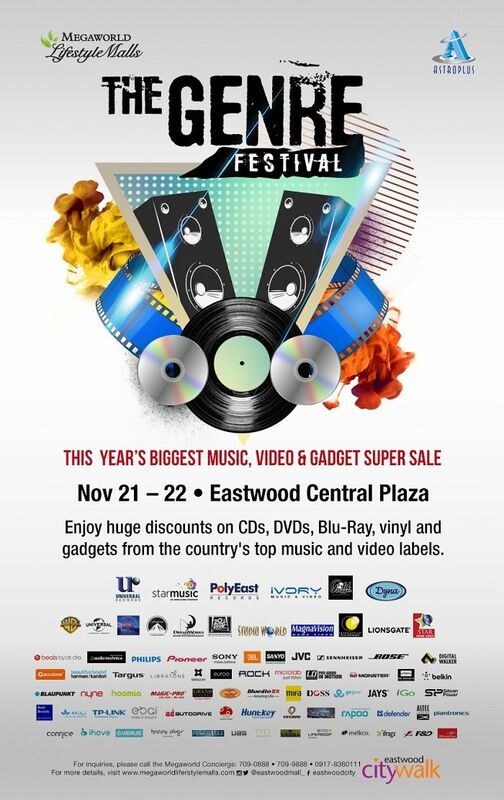 Happening on November 21 to 22 at the Eastwood Central Plaza, The Genre Festival gathers over 70 brands and music labels all in one roof, offering shoppers huge discounts on the widest selection of CDs, DVDs, vinyls, gadgets and more. Music fans can explore a great selection of marked-down CDs from classic albums of both local and foreign recording stars and artists, to hard-to-find records and classics including those that are hardly seen in regular record stores. Vinyl collectors will also have their hands full scouring for new finds to add to their collection as over 5,000 vinyls of well-loved musicians from past generations await them at the Genre Festival. Movie buffs, meanwhile, can also go over the huge collection of DVDs on sale and buy copies of the latest Hollywood and local flicks as well as their favorite blockbuster and well-loved classics. Fans of American TV series as well as followers of Asian drama and soap operas are also not left out as they can also getto check out complete sets of DVDs of their favorite shows, available at a discounted price. Gadget-loversare sure to fancy the great deals and huge discounts they can get on mobile phones, tablets, laptops,power banks, mobile phone accessories and cameras from leading brands as well as other entertainment gadgets such as DVD players, portable video players, gaming consoles, karaoke systems, speakers, earphones and more. Start your Christmas shopping now at the Genre Festival, this year’s biggest music, video and gadget sale open from 10AM to 10PM at the Eastwood Central Plaza. Get great deals and big discounts from these participating brands and labels: Universal Records, Star Music,PolyEast Records, Ivory Music&Video, Gold Digger, Dyna Music, Warner Brothers, Universal Studios, Disney, Paramount Pictures, Dreamworks, 20th Century Fox, Studio World, Magna Vision, Interactive Digital Entertainment, Studio World, Star Home Video, Lions Gate, Beats by Dre, Audio Technica, Philips, Pioneer, Sony, JBL, Sanyo, JVC, Sennheisser, Bose, Digital Walker, Accutone, Harman Kardon, Targus, Libratone, Euroo, Rock, Microlab, LD Systems, Monster, Belkin, Blaupunkt, Nyne, Hoomia, Magic-Pro, Grand Videoke, Wow Videoke,Bluedio, Mifa, Doss, Go Gear, Jays, iGo, Silicon Power, Best Brands, MiLi, TP-Link, Ebai Mobile Power, Mushroom Wireless, Autodrive, Huntkey, Co Caine, Rapoo, Defender, Altec, Plantronics, Connice, ihave, Verus, Happy Plugs, Powerxell, Urban Armor Gear, Varna, Melkco, iFrogz, F&D and many more.